Amazon Web Services will locate in the One Dulles Tower building. “Amazon” has been the word on the lips of business leaders lately in Northern Virginia. And it’s not just because the region is among the finalists looking to snare the company’s planned second headquarters. Months before Northern Virginia was announced as a top 20 contender for Amazon’s “HQ2,” the state had sealed a deal with Amazon Web Services Inc., an Amazon.com company, to locate its new East Coast corporate campus in the Herndon area. “Historically Virginia has had a great corporate relationship with Amazon; Amazon has a large presence already” in the state, says Suzanne Clark, communications director for the Virginia Economic Development Partnership. Clark says then-Gov. Terry McAuliffe met personally with Amazon representatives and that the VEDP worked with the General Assembly’s Major Employment and Investment (MEI) Commission to craft the deal that was announced June 8. Commonwealth officials announced that Virginia beat out Texas and Washington state for the project. The custom performance state grant approved by the governor and the MEI Commission states that after the hiring of 600 new employees, AWS will be eligible to receive $7,000 per net new job created, up to 1,500 total jobs. Amazon Web Services is a secure cloud services platform that offers compute power, database storage and content delivery. According to the company, positions at the Herndon corporate campus will be mainly technical roles in the cloud computing business. 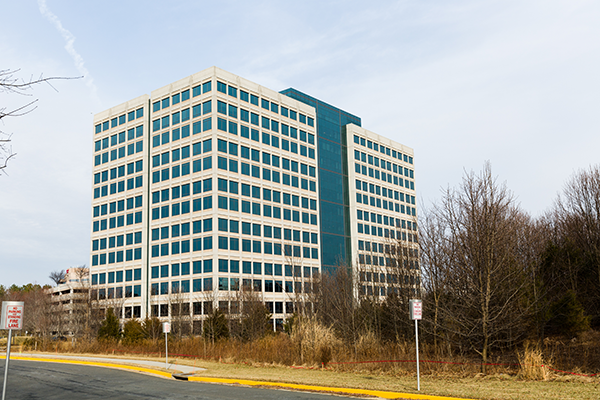 The location chosen by AWS is One Dulles Tower, a 400,000-square-foot Class A office building at 13200 Woodland Park Drive on the Dulles Toll Road. Federal Capital Partners acquired the building from Corporate Office Properties Trust in October 2015 for a reported $84 million. One Dulles Tower had been leased to Booz Allen Hamilton, which vacated the building at the end of 2015. The site is about two miles east of Washington Dulles International Airport and about one half-mile from both the future Herndon and Innovation Center Silver Line Metro stations. Of the Fairfax population 25 years old and older, 60.3 percent have a bachelor’s degree or higher. Across the county line in Loudoun the figure is 58.8 percent. Loudoun County has the highest median household income in the country; Fairfax is second. Gordon says Amazon Web Services, with its new corporate campus in Fairfax County and existing operations in Loudoun County, fits what has become the Northern Virginia model. As much as 70 percent of the world’s internet traffic flows daily through data centers in Loudoun, according to the county’s economic development office.